Life for the city dog- a continuous wait – looking forward to the return of her guardian, in which the long hours are mostly spent sleeping. And when the clock strikes the time of return- the bundle of energy is all set for play and activity, which are at times met enthusiastically by the guardian while other times the lil one has to wait till her pet parent indulges. Now imagine a situation where you are at work and your pooch is also having the time of her life interacting with doggy buddies, playing , romping, using mental and physical energy and if possible in natural environs. This would keep her mentally active and stimulated. Dogs are social and it is very important getting them socialised with their fellow companions. Lack of socialisation also leads to behavioural problems, which is also a big reason wherein certain people abandon their pets. The other benefits are that the dog is not bored and has a purpose and interest and can enjoy joie de vivre. Even certain small breeds have high energy levels, which can be properly channelised in a day care facility. A day care facility would also make the gaurdian happy as one can see one’s pet healthy and happy. One such initiative taken by Rajesh and Shailendra in Gurgaon is called Kennel?1, which is a complete doggy heaven. A place where Sparkle had a ball, made buddies, romped and was completely happy, which was evident the moment he reached there till he slept at night, totally contented. I then made a resolution to take him there more often. So here’s from Sparkle and Team of Dogs and Pups -wishing you all a great 2006, making resolutions with a difference-may it be exercising your lil’ darling, taking them on vacations, camps, socialising them, finding out places which are dog friendly- so that together you can enjoy this special bond and celebrate the whole year through. Owned by our furry angels, making their wish our command – a new phase has come where we can actually pamper our lil’ babies. A lot of people have started addressing themselves as pet parents and share the feeling that these darlings are an integral part of the family, who not only give love, but keep the family together and they cannot think of life without their four-legged sweethearts. The foremost thing as responsible pet parents is the health and safety of one’s pet, which makes me wonder, God forbid if emergency strikes at an unearthly hour, who do I call? Where do I go? What do I do? Now imagine a pet care centre which is run 24/7, doesn’t that feel secure? As the number of people who share their lives with their canine babies has grown and is growing everyday, it becomes essential to have facilities that take care of their furry angels. So hoping in the coming year, we have facilities that take care of this need. Till such time comes, it would be good if one could speak to one’s veterinary doctor and be aware of the numbers at which they can be contacted at. To be on the safe side, keep these numbers handy with all members of the family. Also in times of natural calamities, while ensuring our safety, we must ensure the safety of our pets as well. Recent instances of earthquakes and floods rendered many pets homeless and many succumbed to the vagaries of nature. But, there were a lucky few pets who were saved and protected by pet parents. Kudos to those pet parents! On a lighter note, the nip in the air is back and it’s time again to look forward to festivities, goodies and wait for Santa. Ensure that your lil’ one is warm, cosy and cuddled with you. Sparkle loves this time of the year and woofs a very Merry X’mas to you all. It is a pathetic situation to see puppies dying without reason after prolonged stressful management of breeding and whelping. 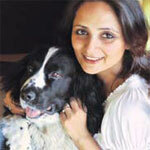 To avoid such a mishap, here are tips to ensure that your puppy leads a long and healthy life. Understanding of development of body and its function during early infant period of puppy is essential for all breeders and dog lovers, who often face problem in the management of neonatal puppies. Mortality of puppies can be as high as 30% with 65% of death occurring during the first week of life. Puppies who die immediately after birth are often called “fading puppy syndrome”. A “fader” is a puppy apparently healthy at birth but failing to survive beyond two weeks of age. Even though causes for puppy loss may be many like congenital defects, nutritional diseases (of dam or puppy), abnormally low birth weight, trauma/stress during birth process, maternal neglect, infectious disease, etc, the most common reason is due to neglected and improper management of puppy during the illness. Puppies are born in a very care-dependent state with poorly developed body systems. Their organs develop during early period of puppy life. They are born with closed eyes and ear canal, with no ability to maintain their own body temperature. They can’t react or move away from external stimuli and even elimination of urine and motion needs lick stimuli from mother over the perineal region. They start gaining these functions progressively only from three weeks onwards. Conditions like reduced blood sugar (hypoglycemia), reduced body temperature (hypothermia) and reduced water content of body (dehydration) are the most common high risk conditions that cause death during first two weeks of life. Puppies are usually born with very less fat body store (1% of body weight in new born puppies, 10% in two weeks puppies and more than 20% of body weight in adults) and glycogen (energy stored in liver), which can only supply energy for 12 hours during fasting. In contrast, adult dogs can undergo weeks of starvation without developing hypoglycemia. Depletion of glycogen and fat stores occurs rapidly due to inadequate intake of food. Causes include insufficient milk production (both in quality and quantity) by the mother, premature birth, dominance by other puppies, low birth weight and parasites, infection and other causes, which prevent puppy to nurse normally. As the newborn puppies cannot regulate their own body temperature, they depend on optimal environmental temperature during the first two weeks of life. Once a puppy’s rectal temperature drops below 34.50C (94F), he becomes less active and nurses ineffectively, bowel movements stops and digestion no longer occurs and puppy becomes motionless at 32.50C (90F). Apart from environmental temperature, other conditions like insufficient milk intake by the puppy due to disease, inability to reach the mother’s teats, inadequate production of milk, infected milk and disease of mother may also contribute to hypothermia in puppy. Orphan puppies suffer more due to this condition. Increased environmental temperature, reduced intake and diarrhoea also result in dehydration. All the conditions namely hypoglycemia, hypothermia and dehydration are interrelated, occurrence of one condition may lead to onset of other conditions. Management of these critical conditions by the owner or/and with the help of his vet can save the puppy. The main treatment goals are to regain body temperature, maintain normal blood glucose level and hydrate the puppy. These can be achieved by the following procedures. Chilled puppies should be rewarmed to 34.50C (94F) after administration of 10% glucose solution or baby food or honey (energy source) at doses of 1 ml/100gm of body weight every two hours orally, if the puppy has suction reflex or through stomach tube (infant feeding tube size 5 or 6 can be used). In delayed critical case, subcutaneous injection of mixture of equal amount of 5% glucose solution and ringers lactate solution (97ºC) at the dose rate of 1ml/30gms of body weight can be given (repeated as needed) till he starts suckling on his own. Puppy should be warmed slowly and progressively over a period of 1 to 3 hours by warm water heating blanket or with poultry incubator (98F). Core warming of body can also be effected by giving enema with preheated (97-98F) normal saline solution which will also help in evacuation of constipated motion and also help in rehydration of energy through absorption of water by the large intestinal wall. Motionless puppies with reduced respiratory rate (less than 20/minute) and discoloured mucous membrane should be kept in oxygen chamber till he recovers. Since the acid concentration of the stomach in puppy is less (pH > 3) than adult, infection through oral route is very common. To treat the condition suitable antibiotics with minimum side effects on the vital organs as prescribed by the vet should be given. Maintenance of optimal temp, ventilation and humidity (60%) in whelping area. Monitoring colostrums and milk intake by the individual puppy. Treating infection of mother (uterine/mammary infection). Measurement of daily body weight gain in puppies. It is an important tool to measure the food intake and general health of the puppy. Body weight of individual puppy should be recorded within 24 hours after and then daily for first four weeks of life. Normal puppy gains 5% of the current body weight daily for the first four weeks. The puppy’s body weight often doubles by 10 days after birth and triples by third week. Between one and two months of age, daily weight gain may reach 3gms/kg of adult body weight. Consistent monitoring and timely treatment should help in reducing the loss of puppies in breeding. Since dogs aren’t born fully trained, your puppy will be looking to you for guidance. Good training plays a big role in ensuring a happy and successful relationship between you and your dog. Through puppy care and training, your dog will learn to understand what his human companions expect of him and be better equipped to fit into his environment. Likewise, the better you understand your dog’s behavior, the more rewarding your relationship will be. What you feed your puppy really matters. In fact, he needs special puppy balanced diet chart that contain nutrition with just the right amounts of protein, fats, minerals and vitamins. A puppy’s diet must also be balanced so he receives the right amount of nutrients. Food should be concentrated to allow him to take in all the needed nutrients with a small amount of food. And always make sure your puppy gets plenty of fresh, clean water. Taking care of your puppy’s teeth now will prevent a lot of problems later on in his life. In fact, the number one health problem for dogs, apart from being overweight, is periodontal disease. The accumulation of tartar and plaque and the resulting gingivitis can lead to more serious disease. So start brushing your puppy’s teeth now, because most dogs over two years of age who haven’t received regular dental care have these dental problems, so start with best puppy dental care in the same you brush your teeth everyday. Part of the normal routine for a healthy puppy is regular exercise. The amount your dog needs will depend not only on his size, but also on his breed. Don’t make the mistake of over-exercising your puppy, however. A growing puppy’s bones aren’t yet strong enough to cope with the extra stress this puts on him. Ideally, you should choose a vet even before bringing your puppy home. Then, once your puppy is home, you should take him in to the vet within the next day or so for an overall check-up. In the first few months, there’ll be several visits to the vet for various vaccinations and spaying/neutering. Once your pup reaches adulthood, at least one visit a year is required to ensure his ongoing good health. You can play a big role in keeping your puppy healthy by doing health check ups at home. Checking his weight, coat and skin, eyes and ears, teeth and gums, and doing spot checks can prevent little problems from turning into big ones. One of the best ways to teach good canine manners is to allow your puppy to interact with an adult dog. Most adult dogs won’t be aggressive toward a puppy though sometimes, a big dog will find a way to put a puppy in its place, perhaps with a growl or a snap. Don’t prevent an adult dog from doing this, since puppies learn to limit the strength of their bite and how to control themselves. If you prevent an older dog from controlling a puppy, then the puppy soon learns to think of himself as the boss and that he can do anything he wants. Raising a puppy requires a lot of love and even more patience. Educate yourself by reading dogs and pups magazine as much as you can about raising a dog, talking to other dog owners and communicating with your vet. This will eliminate many “surprises” along the way, and will put you well on the path to building a strong, long-lasting relationship with your puppy.